All physical storage media, including hard drives, flash drives, and even solid-state drives fail eventually, and without a backup, your precious data could be lost forever. Moving your files, photos, and documents online to the cloud is one of the smartest computing decisions you can make. And one that everyone should make (like, today, immediately after reading this article). With cloud storage, your files are encrypted and backed-up securely to multiple servers owned and managed by the company you choose. Think of it as a giant flash drive that you always have access to, from any computer or device. Not all cloud-storage services offer the same functionality, so make sure you pick the one with all of the features you want. Here's a list of some key ones to think about. You can use most cloud-storage services on your smartphone or tablet, as well as on your laptop or desktop. Check that the service has a dedicated app for your brand of tablet or smartphone. Surprisingly, some services don't let you edit documents within cloud storage itself—instead, you open the file outside of the storage service, then it syncs automatically. Most services let you share your files with other people: for instance, you might want to share some holiday snaps with your family. Some don't, though, so consider whether it's something you'd like the service you choose to do. What this means is that your edited files will automatically have their changes updated in the cloud-storage service. Most modern services offer this, although some don’t, which isn't as smooth of a process. This lets you roll back to an earlier version of a document, which is useful if something goes seriously wrong. There are dozens of cloud storage providers available. Let’s explore 3 of the most popular services. Dropbox offers users 2 GB of space for free, with the option to pay for more space. Dropbox users can access files and folders at any time from a number of interfaces, including the desktop, web, and mobile clients, or through third-party applications connected to Dropbox. Each has security settings and features that process and protect user data while ensuring ease of access. All of these clients connect to secure servers to provide access to files, allow file sharing with others, and update linked devices when files are added, changed, or deleted. The actual contents of users’ files are stored in encrypted blocks with this service. Each individual encrypted file block is retrieved based on its hash value, and an additional layer of encryption is provided for all file blocks at rest using a strong cipher. File data is encrypted using 256-bit Advanced Encryption Standard (AES). This is the same encryption governments worldwide use to protect their data. For a cute, illustrated explanation of how it works, click here. Dropbox regularly tests their infrastructure and apps to identify and patch vulnerabilities. They also work with third-party specialists, industry security teams, and the security research community to keep users and their files safe. For more information, click here. Have a Gmail account or an Android phone? Then you already have a Google Drive account. Drive starts you off with 15 GB of free Google online storage, so you can keep photos, stories, designs, drawings, recordings, videos—anything (with the option to purchase more storage). The website and Android app offer a Backups section to see what Android devices have data backed up to the service, and a computer app that allows users to backup specific folders on their computer. A Quick Access feature can intelligently predict the files users need: on the website, users can search for an image by describing its visuals, and use natural language to find specific files, such as, "find my budget spreadsheet from last March." Google Drive incorporates a system of file sharing in which the creator of a file or folder is, by default, its owner. Files or folders can be shared privately with particular users having a Google account, using their @gmail.com email addresses. Sharing files with users not having a Google account requires making them accessible to "anybody with the link." This generates a secret URL for the file, which may be shared via email or private messages. Files and folders can also be made "public on the web," which means that they can be indexed by search engines and thus can be found and accessed by anyone. The owner may also set an access level for regulating permissions. The three access levels offered are "can edit," "can comment" and "can view." All of your files in Google Drive are encrypted: files in motion are protected using 256-bit AES encryption, while those at rest are encrypted with 128-bit AES keys. For more information, click here. OneDrive offers users 5 GB of free storage (again, with the option to purchase more). Office 365 subscribers get 1 TB of free storage and also get access to Office Online. Office Online allows users to upload, create, edit, and share Word, Excel, PowerPoint, and OneNote documents directly within a web browser. In addition, Office Online allows multiple users to simultaneously co-author Excel documents in a web browser and to co-author OneNote documents with another web user or the desktop application. Users can also view the version history of Office documents stored on OneDrive. Microsoft has released OneDrive client applications for Android, iOS, Windows 8, Windows 10, Windows 10 Mobile, Windows Phone, Xbox 360, and Xbox One, that allow users to browse, view, and organize files stored on their OneDrive cloud storage. In addition, Microsoft also released desktop applications for Microsoft Windows and OS X that allow users to synchronize their entire OneDrive storage with their computers for offline access, as well as between multiple computers. The Android, iOS, and Windows Phone versions also allow camera photos to be uploaded automatically to OneDrive. OneDrive also uses 256-bit encryption for users’ files. However, data stored on OneDrive is subject to monitoring by Microsoft, and any content that is in violation of Microsoft's Code of Conduct is subject to removal and may lead to temporary or permanent shutdown of the account. For more information, click here. For users who want the highest level of protection for their data, they need to choose a company that uses zero-knowledge proof. In cryptography, a zero-knowledge proof or zero-knowledge protocol is a method by which one party (the prover) can prove to another party (the verifier) that a given statement is true, without conveying any information apart from the fact that the statement is indeed true. For a fun example of what that previous sentence means, click here. What this all boils down to is that only you have access to your data. Sync.com is one of the top-rated zero-knowledge cloud storage providers, and they built a cloud storage platform based on a foundation of absolute privacy. Located in Canada, Sync is safe to use, no matter where your business operates, with US, EU, UK, and Canadian compliance built-in. Sync’s end-to-end encryption protects your confidential data in the cloud from unauthorized access at all times. How does Sync accomplish this? A randomly generated 2048 bit RSA private encryption key serves as the basis for all encryption at Sync. During account creation, a unique private key is generated and encrypted with 256-bit AES GCM, locked with the user’s password. This takes place client-side, within the web browser or app. PBKDF2 key stretching with a high iteration count is used to help make weak passwords more cryptographically secure. At no time does Sync have access to a user’s private key. Nobody, not even the head of Sync can access your files or give anyone else access to them: two-factor authentication, granular user permissions, remote wipe, custom passwords, expiry dates, notifications, and more, ensure you're always in control. For even more details about how secure your data will be with Sync, click here. Not using a service that continually backs-up your data is akin to playing with fire. And remember the three B’s: backup, backup, backup. You don’t have to choose just one cloud service: use multiple cloud companies! So, now that your data is secure, you can sit back and relax. Happy Holidays from all of us here at Armor! 1. 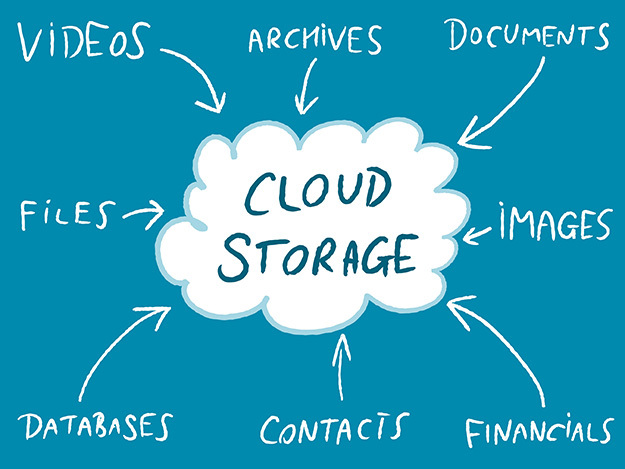 "Where Does Cloud Storage Really Reside? And Is It Secure?" The New York Times. 2. "Is my data safe in online drives, or should I back it up as well?" The Guardian. 3. "Cloud Storage Is Much More Secure Than You Think." Forbes.